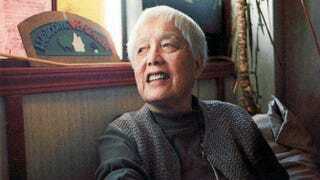 Grace Lee Boggs, who died Monday at the age of 100, knew every major black leader and luminary worth knowing from the 1930s to the 1960s, and a little beyond. Here’s some proof: She and her husband, fellow activist Jimmie Boggs, assisted Malcolm X and saw him whenever he was in Detroit during the short period between his famous address there, “Message to the Grass Roots,” and his 1965 assassination. In the 1930s she became a protégé of C.L.R. James, the great Marxist thinker from Trinidad. In the 1940s a young man named Kwame Nkrumah, future president of Ghana, met and began corresponding with her and James and other Marxists. She was inspired by A. Philip Randolph and came to know Katherine Dunham and Richard Wright. So how did a poor Chinese woman, whose bootstraps sent her first to Barnard College, then on to a Ph.D. at Bryn Mawr College in 1940, get swept up in the civil rights movement, becoming one of its accepted leaders when the black power call came? The racial and sexual discrimination she faced as a Chinese woman gave her an outlook that pushed her into the labor movement as a Marxist. She couldn’t get a job. Living in—and becoming involved in protesting—bad housing in Chicago led to her meeting and learning about black people. Randolph’s “March on Washington” movement taught her a truth as powerful as Marx and Hegel: “I found out if you mobilize a mass action, you can change the world,” she said in a documentary about her life. And people were mobilizing, particularly in autoworker-centric Detroit. So she went to be “where the workers are” and to edit a worker’s newspaper, Correspondence. She met Jimmie Boggs, a black autoworker and Marxist thinker who became a reporter for her, and by the end of their first date they were engaged. They were wedded, literally and in activism, for 40 years, until Jimmie Boggs died in 1993. This was a time of leaflets, of word-of-mouth organizing. Of radical newspapers and magazines, national and local. Of union organizing and post-World War II organizing protests, most notably that bus boycott in Alabama that a young reverend down there started. Although she was one of the organizers of the 1963 Detroit civil rights march (King performed a rough draft of “I Have a Dream” there), she turned to Malcolm. When the Boggses were excluded from the city’s mainstream movement because they were too radical (read: They were Marxists), they and others organized the Grassroots Leadership Conference. That’s the stage upon which Malcolm gave his “Message to the Grass Roots.” Eventually, black leftists in Detroit and across the nation felt that the time for just studying revolution was over. The alarm went off; it was nation time. So she became a founder of the Freedom Now Party—its only nonblack member. The Detroit rebellion of 1967—an insurrection that nearly destroyed the city in ways from which it has still yet to recover—forced her to think again about what kind of change was possible and what that took. Over the next 40 or so years, her home was a place where people of all races and ages would come and talk strategy. What should we do next? What mistakes did we make that we can’t make again? How do we move forward in a new way? How much do we have to transform ourselves first before we take on the world? It is no longer popular to talk about Marxism or communism or even socialism. (No one but those who run Fox News is afraid of anyone calling for black nationalism, because white people in power now know that that impulse is easily quelled with the right concessions.) It is considered nostalgic to talk about revolution. That term itself has been redefined—reduced, really—to continual, gradual change punctuated by occasional, radical upsurges, à la Black Lives Matter. Grace Lee Boggs represented those who were behind, under, in front of, over and around the discussion and occasional attempt at revolution in mid-20th-century America. Her joining the realm of the ancestors—hers and ours—at the close of her century of writing, organizing and thinking signals, yet again, the tension between the old and the new: the search for new ideas and new strategies and tactics for the purpose of implementing old freedom dreams.